This week proves to be very busy for me. We had 2 back-to-back birthdays, 1 anniversary and finally tomorrow is Saraswati puja. The puja this year is important for us as our son’s writing initiation or hatekhori would be done tomorrow. This is a Bengali tradition where in front of the goddess the priest will introduce the Bengali alphabets to the child. The parents offer flower and pray to the goddess for her blessings to be showered on the child. Our kid is extremely excited. Though not sure but he thinks something important is going to happen to him tomorrow. After making 2 birth day and 1 anniversary cake and cooking full birthday dinner for my father on his birthday am too tired to get excited about this. But right now am an emotional mush, this happens to me every time he makes me realize that he is growing too fast. Anyways here is a quick recipe that a reader of mine asked for. 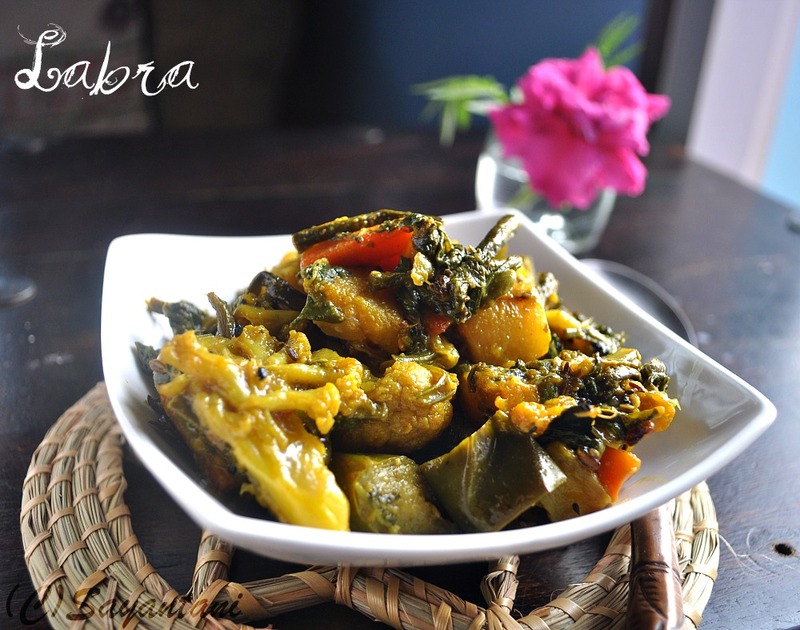 Labra is like an Bengali ratatouille or vegetable mishmash. Lots of varieties of vegetables are cooked together with ginger and Bengali five spices till they are soft and coated in their own juice. This is a very basic and simple dish but very rich in flavours. Mostly served on puja days with niramishkhichuri and roasted papad. Prepare the veggies as mentioned above. Wash and keep them separate. Heat the oil in a heavy bottom pan or a kadhai. Add the panch foron, dry chillies. Once they splutter add the hing. Immediately add the ginger paste mixed with 1 tbsp water and salt. Stir and cook till the water evaporates. Add the cabbage, radish, carrots and yard long beans. Stir and add turmeric. Cover and let it cook for 3-4 minutes. Adjust the seasoning and add ½ cup water and sugar to balance the taste. Cover and cook till the water is absorbed and the veggies are coated with the gravy. This is a dry dish so adjust the water and cooking time as required. You can also add sweet potatoes, broad beans, drumsticks and potatoes. looks super delicious..very nicely presented..
looks super delicious, new to me.. This looks like one healthy dish with so many veggies, very delicious..
this is ghanta in orissa... Love the combination of veggies, tastes great! All the best to your son! This is called just in time recipe and that too from you. I am gearing up for making Labra today and will follow your recipe. Let me see what all I have missed. Simply healthy and hearty,wat a fabulous looking labra..
healthy and nice!..all the best to your son. Tempting..I loved the way you presented it ! A mix of veggie- very simple and delicious one. Happy Saraswathi Pooja! I love the mix of vegetables used here. Such a hearty and delicious winter meal!!! Sayantani, I love this Recipe. This would be an excellent start for me to learn making Bengali dishes.I have the Panchforan. Labra is a Healthy and delicious meal !!! 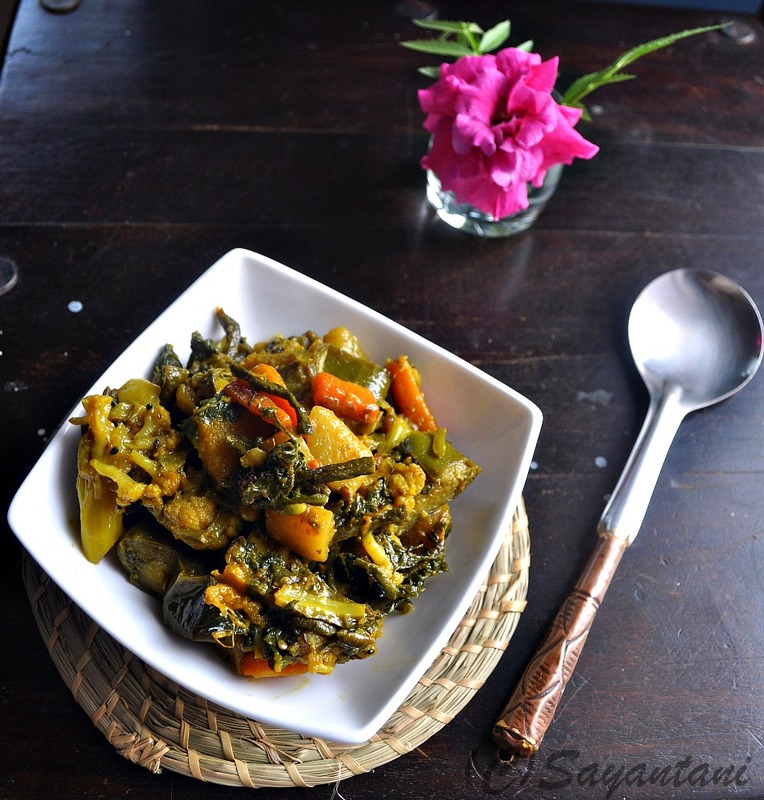 Labra recipe sounds very delicious and healthy veggie pack :) nice click as well.. Check out this site : (http://www.desifoodbuzz.com/category/indian/bengali-indian-2/).... The bengali food is all copied mostly from you, Click on the gray button which says Read More and the entire post is copied. And many more posts... The above link goes on and on with yours and Jaya's and few others recipe. Are you aware of this? This site is copying from everyone! Tried and tested today. Thanks for the recipe.